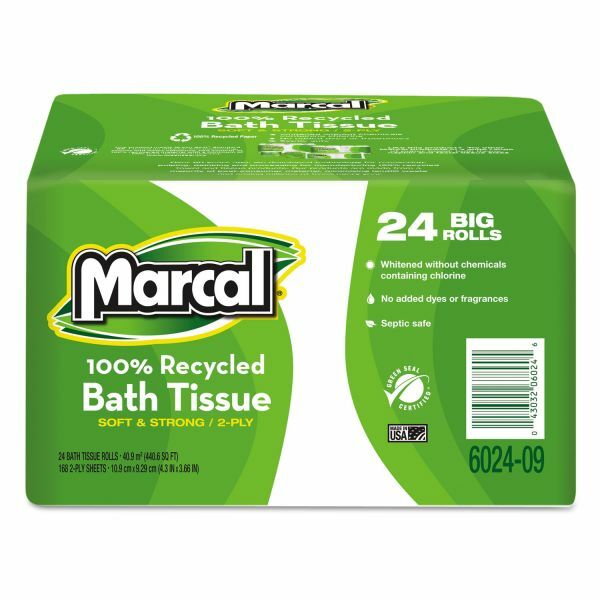 Marcal 100% Recycled Toilet Paper Roll, 2-Ply, White, 3 7/10 x 4 33/100 Sheet, 168 Sheets/Roll, 24 Rolls/Carton - Recycled bathroom tissue is Green Seal certified and whitened without chemicals containing chlorine bleach. It is hypoallergenic and has no added dyes or fragrances. Septic-safe tissue is soft, strong, absorbent and virtually lint-free. 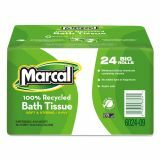 It comes on individually wrapped rolls for convenient, sanitary storage so it's ideal for all office sizes. Each roll contains 168 perforated sheets. Tissue is made from a high percentage of recycled fiber. Use in standard, household bathroom tissue dispensers.